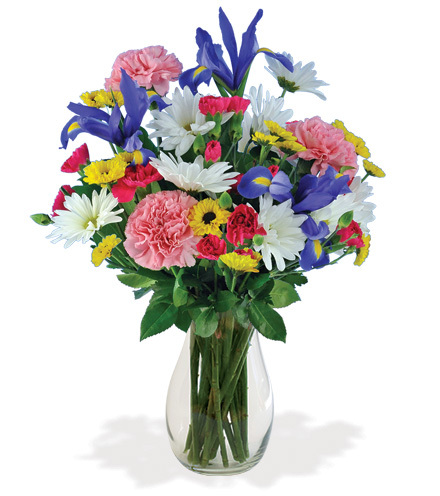 Let them know they are in your thoughts by sending this beautiful everyday bouquet. This arrangement is a perfect surprise for a loved one who is celebrating a special occasion, or as an uplifting gesture of sympathy and support to friends and family who have just lost a loved one. Brimming with a collection of bright flowers, our flower experts will hand-select a variety of blooms such as purple iris, pink carnations, viking poms, hot pink miniature carnations, and fresh accent greens for your stunning bouquet. Add some chocolate or balloon to your delivery for some extra sentiment.